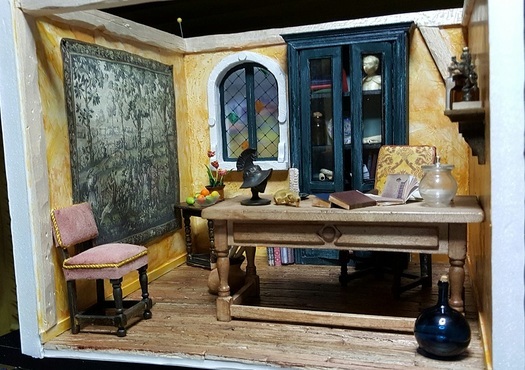 Norwalk, CT – Throughout the month of December, the Norwalk Public Library hosts a display of miniature room constructions made by artist Vance Alexander, in the entry lobby, located at 1 Belden Avenue, Norwalk. 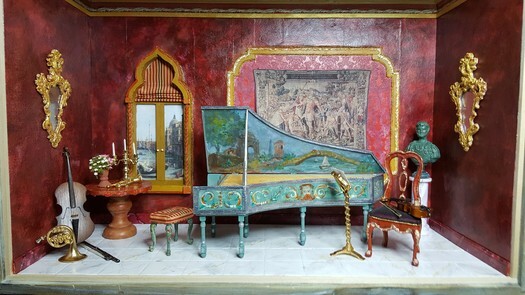 Alexander, who has been a collector of miniatures for most of his adult life, created projects in 1/12” scale as a student in architectural and interior design. After retiring in 2017, he made his first “just for fun” room box and hasn’t stopped since. He produces most of the furniture and architectural elements by hand, using tools like X-acto knives, saws, mini files, carving tools, and dental tools for working on fine details. In addition to his career in architectural and interior design, Norwalk resident Vance Alexander writes short stories. His work has appeared in national magazines, literary journals and anthologies. He is the author of Expectant Journey.